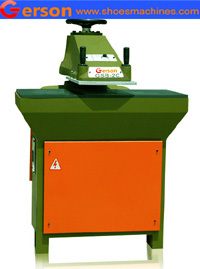 This cutting press used as cutting soft material with die . 1.Two hand operation make sure the worker safe when woking . 3.From the smallest 10 Ton to 25 Tons for your choice. 4.It is very easy to adjust height of swing arm from table by simple handle.